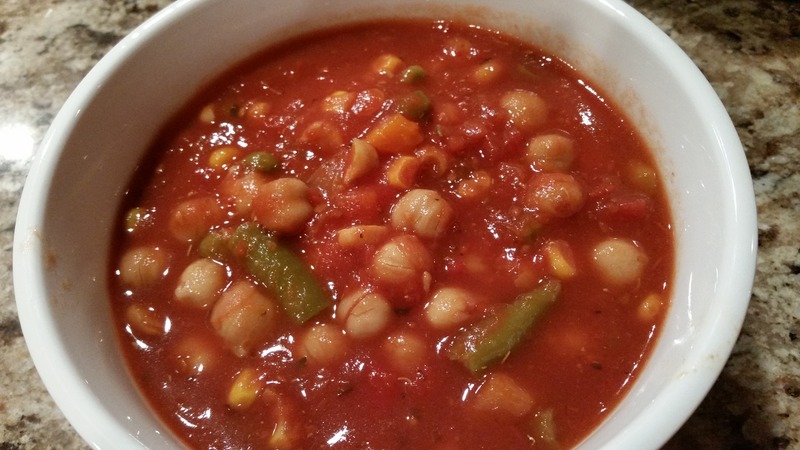 Slow Cooker Vegetarian Vegetable Soup – What's for Dinner Moms? This is my third slow cooker recipe in the past few days. My slow cooker is getting a workout while we are getting ready for Thanksgiving and Christmas. I have lots of errands to run and the kids have tons of concert, recitals, classes, and parties to attend so I am constantly in my car. I need to use my slow cooker so that when we get home I know there is something hot to feed everyone (in shifts if we need to). I had this soup going and bread in the bread-maker so that when my son finished his Latin class he could have dinner. We would not be able to eat for another hour or so but everyone had a delicious hot meal. My son was NOT pleased with the soup. He is not a fan of broth based soups, garbanzo beans, and vegetarian food in general. He informed me of these things as he was telling me that the soup had a good flavor, the bread was great for dipping, and it was very filling. Well, at least I got a few things right! This soup was so easy to make the hardest part was opening the bags, bottles, and cans to pour the ingredients into the slow cooker. Add all ingredients to slow cooker. Cook on low 6 to 8 hours. Stir well before serving. Add parsley, fresh basil or other toppings as desired when serving. Looks good! I may need to give this a try! A lovely recipe for soup, Marci. Sounds good to me. I would have to have a side of meet for Hubby. Or maybe lots of fresh bed with butter and cheese. 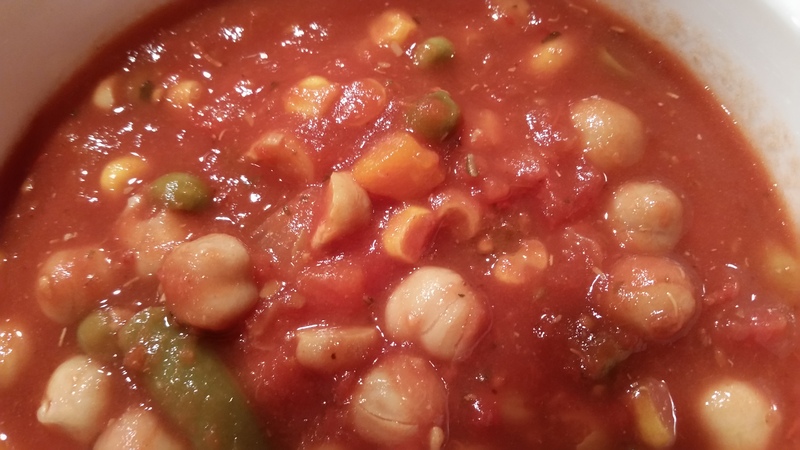 Frozen mixed vegetables are often my secret saving ingredient! My son is right there with your husband. This sounds pretty easy to make and it looks good, too. I’ve been talking about looking for a soup to make in my slow cooker. What size slow cooker did you use? I have a 6qt. slow cooker. It was about 2/3 to 3/4 full. I kind of figured that it was that size. Thanks.